The area where this flooded parking lot is located is called Orchard Road home to the rich and famous and is also filled with shopping centers and entertainment. 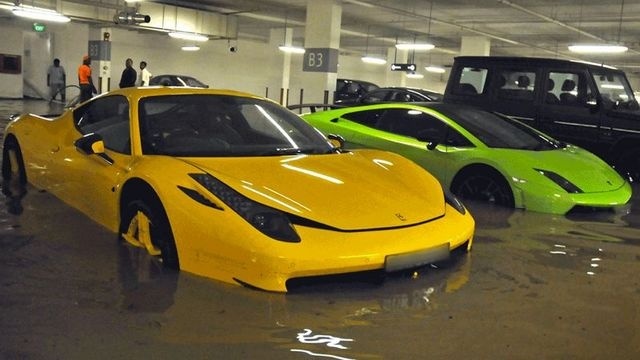 Torrential rains flooded an underground parking structure of Singapore’s St Regis Residences at Tanglin Road, causing major water damage to several exotic sports cars owned by residents of the luxury tower where a 4,000 sq ft. suite costs US $ 10 million only. Thanks to Singapore strong stock market and booming economy, luxury cars were the strongest sector if automotive sales growth with Ferrari and Rolls Royce the market leaders. I can spot a Lamborghini Gallardo, Ferrari 458 Italia, Rolls-Royce Phantom, a handful of BMWs, an Aston Martin, a few Audis, a Maserati GranTurismo and one very sad looking Porsche. The only owner who might be able to muster up a smile is the one with the keys to the Mercedes-Benz G-Class.